French Talmudist; flourished in the first half of the thirteenth century; progenitor of the De Latas, or Lattes, family. He took the name of the city in which he was living, his son Jacob afterward adopting the name of "Lattes." Isaac b. Jacob Lattes, the author of "Sha'are Ẓiyyon," speaks of these two ancestors of his, and ascribes to one of them, in a somewhat obscure reference, the authorship of several works. 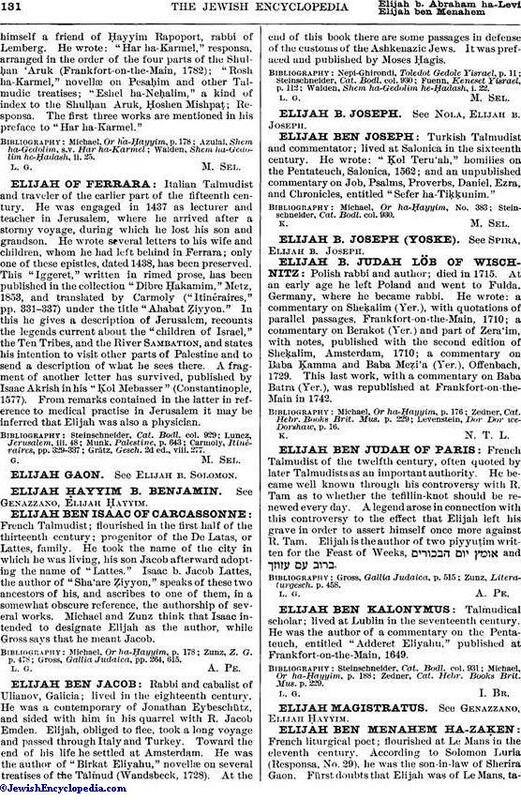 Michael and Zunz think that Isaac intended to designate Elijah as the author, while Gross says that he meant Jacob. Gross, Gallia Judaica, pp. 264, 615.